Every day, moms from across the world send me nursing photographs to share to the Mama Bean Facebook page. To celebrate motherhood, to embrace shared experience and to normalize breastfeeding...because the more we see it, the more normal it will become. So when the following picture landed in my inbox, I couldn't help but smile. 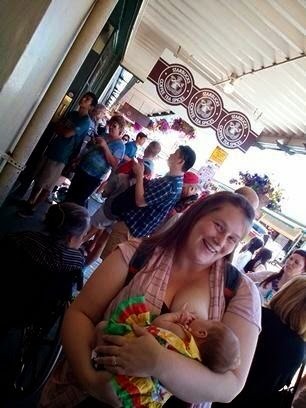 You may have to zoom, but the sign behind this mom bares the original Starbucks logo...and I mean 'bares' quite literally. Because little by little, our sense of womanhood is slowly being censored by the world around us. Piece by piece, our sense of motherhood is being squeezed, shaped and filtered by the media and in our busyness - in our sleeplessness - we barely even notice. I suppose it speaks volumes then, that it's plausible to identify more with a 16th century mermaid than with most of the images of femininity that we see around us today…with her rawness, her realness and yes – her breasts. With her unsymmetrical and unapologetically natural breasts. And so there she remains, on a busy street in downtown Seattle. There she remains, watching over the crowds of customers and perhaps, with a knowing smile and a nod to femininity, watching over mama Olivia too, as she nurses her sweet babe with a smile. Thank you to mama Olivia for allowing me to feature her picture in this piece. For more photos in celebration of breastfeeding and motherhood, join the Mama Bean village on Facebook!